I just spent the past 10 days traveling up and down the east coast, covering 7 states and driving over 3,000 miles. The highlight of the trip was celebrating my father’s 85th birthday with family and friends in Annapolis, Maryland. Along the way, I also spent a couple days with one of my best friends in Roanoke, Virginia, visited with my sister and her family in Fredericksburg, Virginia, covered eastern Maryland with my step-nephew, and …oh yeah…played a couple rounds of disc golf too! OK, a little more than a couple – I ended up playing 42 rounds on 35 different courses in…you guessed it…7 different states! A whirlwind trip indeed. It all started after work on Friday, March 28th, in which I drove 8 hours straight til I got to Walterboro, South Carolina. 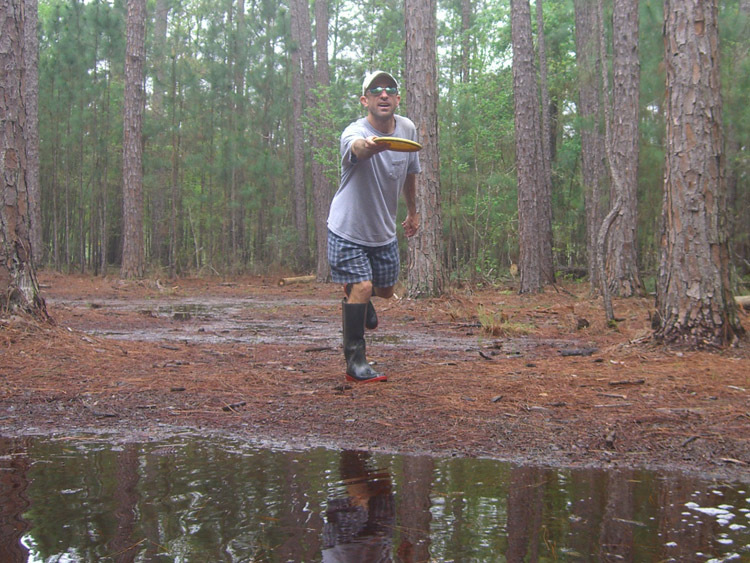 The next morning, I drove to Charlotte, North Carolina, where I spent most of the day playing disc golf…in the rain. I actually managed to stay dry for the most part until I hit the last course of the day, where I had a bit of a run-in with a miniature bamboo forest. Leaving my umbrella to cover my discs and to search for my errant throw, the bamboo trees were bound and determined to get me sopping wet, which they very successfully did, as I managed to accidentally kick the water off each and every tree. Let’s just say I spent the long cold walk back to car wringing out my completely-drenched shirt. I then headed up to Winston-Salem to dry off and get ready to play one of my all-time favorite courses the next morning. The good news – it didn’t rain on Sunday; the bad news – it was incredibly windy. I think I actually would’ve traded the wind in for the rain, as it is almost impossible to control your disc in 30 mph winds. After the fun (and very windy) round at Horizons Park, I drove into western Virginia, where I played some more golf, including a round at Ferrum College, where I spent my first year of college at in the mid-80’s. I arrived at my friend’s house in the early evening, where we had a delicious dinner in downtown Roanoke and played with her Wii the rest of the night. Needing a day off from golf, we had a great time catching up and hanging out, including lunch at a super-cool restaurant in Paint Bank, Virginia called the Swinging Bridge Restaurant. Decked out like a general store from the 1940’s, inside is an actual small swinging bridge that hangs over the dining area. Their specialty dishes are the buffalo burgers and buffalo stew, which I most readily sampled. I’d say it tasted like chicken, but it actually tasted like beef. We even drove around town to visit the grazing buffalo. They didn’t seem too thrilled that we just nibbled on one of their own. Back to the road on Tuesday as I headed towards my sister’s place in Fredericksburg, but not before I played 4 more rounds of golf along the way, and enjoyed some delicious ice cream at the famous Carl’s. On Wednesday, I slowly made my way up north to my dad’s, hitting a few of my favorite courses along the way, including my original home course at Pohick Bay Park in Lorton, Virginia. After wishing my dad a Happy Birthday on Thursday morning, I drove up to northern Maryland and Delaware for another fun-filled day of disc golf and driving. I had dinner with my step-nephew and his wife in Seaford, Delaware, where I also stayed the night. Back to the links on Friday, but this time, I was joined by my nephew, as we played around southern Delaware and eastern Maryland. Ironically, we have the exact same first name and the exact same birthday…I just happen to be a little more than a decade older than him (the “college in the mid-80’s” reference oughta give it away). Saturday was the big day for my dad’s b-day party, where he had about 50 of his closest friends and family show up. I can’t tell you how great it was to have both my biological family and my step-family all together at once, as it is a rare feat indeed. But then my dad’s a rare breed himself, and I was so glad to help him bring in the big 8-5 (hey look, another mid-80’s reference). Welcome home TJ and Happy Belated Birthday to Papa Jones! Sounds like an awesome, if not exhausting, time! So I take it there is a master list somewhere of every disc golf course in the good ole USA?? If it hasn’t been written yet, you could be one of those travel writers who gets an advance on his book – – you know, the one you are going to write reviewing and critiquing every course in America? Now THAT would be quite a book! Funny you say that, there actually is a disc golf course directory put out by the PDGA that lists each course not only in the United States, but also all over the world. I have a few copies of these directories, but mainly keep up with the latest courses on the PDGA website. If I play any courses not listed on the site, I usually add them on. This particular trip, I’ll be adding about 6 new courses. Thanks for sharing this with me; I enjoyed it immensely!! !